MTCD365: If I Only Had the One I Love; Sheep-Crook and Black Dog; The Game of All Fours; I Don't Want A Girl; All Over Those Hills; The Atching Tan Song; The Banks of Sweet Dundee; Barbry Ellen; The Bird in the Lily Bush; Betsy the Milkmaid; If I Were a Blackbird; A Blacksmith Courted Me; The Blue Eyed Lover; The Bridgwater Farmer; I Am a Brisk Young Lad; Buttercup Joe; The Butcher Boy; Catch Me If You Can; Clementine; On a Cold and Winter’s Night; The Cows is in the Clover; The Cuckoo; Diddling Song; Fair Wackford Street; Erin Go Bragh; Erin Go Bragh; Fair Ellen; The False-Hearted Lover; The Folkestone Murder; We Dear Labouring Men; Irish Molly-O; Georgie; The Girl I Left Behind; Still I Love Him; Flash Gals and Airy Too; Go and Leave Me; All You Paddies Lay Down; The Pretty Ploughing Boy; Once I Had a Good Little Boy; The Running, Running Rue; The Jealous Lover; The Famous Flower of Serving Men. MTCD366: Green Grows the Laurel; Henry My Son; Billy Boy; The Rich Farmer From Chesfield; I Was A Reckless Young Fellow; The Irish Girl; Betsy; In My Father's Garden; The Prentice Boy; Jel Along; The Jew's Garden; The Jolly Herring; The Blue Jacket; The Little Ball of Twine; The Little Chimney Sweep; Little Poppa Rich; Bold Dollery; Young But Growing; Bold Robert Emmet; Mandi Went to Poov the Grais; McCaffery; My Boy Willy; My Love Cold Beneath My Feet; The Broomfield Hill; The Broomfield Hill; The Lady and the Soldier; Two Pretty Gypsy Girls; The First day in October; The Old Riverside; Old Tom Cat - Rackymandoo; Once I Had A Colour; Johnny Doyle / The Green Bed; Child's Rhyme; The Oyster Girl; The Green Bushes; Riddle; Three Long Steps; The Little Beggar Boy; Sweet William; Twenty-One Years; The Three Butchers; Bell Bottom Trousers; Died For Love; Final Speech; Space - fragments:; Lord Bateman; The Dark Eyed Sailor; Brennan on the Moor; The Black Velvet Band. There is an old saw which states, 'You can't go home again.' Musical Traditions has recently been laying this misconception to rest in no uncertain terms. The first trio of double CDs from the label this year have featured the Willett Family, Cecilia Costello and now Caroline Hughes. Forty years ago a small number of we aficionados who appreciated this type of musical expression (more then than are still alive) bought the Topic Willett, the Leader Costello and the Folktracks Hughes. If you are another of the survivors from that heady period of extensive commercial releases you probably, like myself, thought that further issues of material by those singers, all well advanced in years even then, were pretty remote. We revelled in their thirty or forty minute formats, little dreaming of the ensuing digital revolution which would allow for cheaper product with more extensive running times and opportunities for greatly extended booklet notes. Of course, much research on the singers named above and the songs they sang has been undertaken in the interim period. Steve Roud has imposed order on practically the entire corpus of 'traditional' song, although we're no nearer to a comprehensive and generally acceptable definition of that term than we were then, possibly less so, in fact. The unprecedented explosion of genealogical research has allowed us to both augment and modify oral biographies given by the singers themselves, with many of the building blocks facilitating this being readily available on line. All of which brings us (finally) to this wonderful effort from our apparently tireless editor, Mr Stradling, who to my mind has engineered a staggering coup in gaining access to the source material. 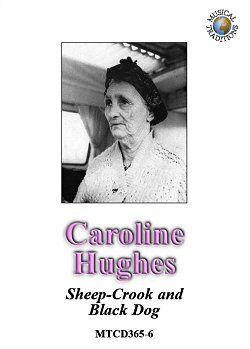 Ever since buying the Folktracks cassette all those decades ago Caroline Hughes has been among my very favourite singers. In fact, I learned many of her songs simply by absorption, by listening to the tape so often. And long before receiving this stunningly good double CD I could sometimes be heard around the house warbling, 'Here's my sheep crook and my black dog, I will give them all to you', or, 'Oh my father he built me a shady bower, and 'e covered it over with sham-a-rock leaves'. And in memory at this very moment I chuckle at her canny retort to Peter Kennedy's comment, "I like the song about the nightingale, Mrs Hughes" : "I know you do, sir, I know you do." The exchange succinctly encapsulates the firm knowledge of a singer acutely aware of just how vital and important are the items in both her memory and vocal chords. If Kennedy's recordings, made very near to the end of her life and rendered from a sick bed are so marvellous (and they are), how much better, then, to have the set of songs presented here, recorded some years earlier when she was in relatively much better health and, consequently, more confident voice. Those particular recordings were made by Ewan McColl and Peggy Seeger, with the booklet quoting extensively from their published volume on Traveller songs. It seems a pity that the very first quoted sentence should contain an error of fact. It claims that Caroline Hughes was 'née Bateman', which was actually the surname of her paternal grandmother, but (as I outline below) she was without doubt the daughter of Arthur Hughes and Lavinia Frankham. In most other respects the notes are of the high standard we have come to expect from MT releases, each transcription replete with its Roud number, a discussion of its provenance and geographical spread, and, where applicable, a useful list of further recordings available in CD form, which allows for ease of comparison of texts and style. And the actual musical content encompasses ninety-one (yes, ninety-one!) songs, ranging from one verse fragments, though diddling ditties used to accompany step dancing when no instrument was readily available, and so on to lengthy ballads, including a version of the very rare Fair Flower of Serving Men (though I'm certain the singer herself didn't call it by that name) at a respectable four minutes, forty-three seconds. In fact, you get so much return for such a meagre financial investment that it simply makes no sense not to have this in your collection. at which point Thompson gives both tune and words, the latter beginning 'As I passed by a willow tree', which is clearly the one referenced here as having been collected subsequently by Lucy Broadwood in 1912. Of more direct relevance to the release under review, what can we glean from the primary genealogical sources regarding Caroline Hughes and her ancestors? As it happens, quite a bit. She was born during October 1900 - 'in a horse-drawn caravan in Bere Regis, Dorset' according to the notes - and her birth registered in the Wareham District, a town a little to the west of Poole Harbour. Even today some areas to the north, west and south of that settlement consist of extensive heath land and forest, an environment then much favoured by Gypsy travellers. In common with a number of her siblings, she was baptised on at least two occasions : on 24 November 1900 in Childe Okeford, some thirty kilometres roughly to the north of Wareham, and on 4 January 1901 at Lychett Matravers, about ten kilometres north. On both occasions she was given as the daughter of Arthur and Lavinia Hughes, the first register adding 'aged 5 weeks, Gipsies, Travelling', the second 'Tramps, Temporary Sojourners'. We might add that Childe Okeford and nearby Okeford Fitzpaine were churches frequently used to christen the couple's offspring, between 1891 and 1902 at least. In fact, one child was baptised in both locations on the same day, 22 February 1893, the one as Athaliah Francombe, daughter of Lavinia Francombe, 'Gipsy, Travelling, living with Arthur Hughes,' the second as Lavinia Hughes, daughter of Lavinia Hughes, 'Travelling Woman'. Caroline's mother was a member of yet another extensive and widespread south country Gypsy family. Her parents appear never to have formally married. One of Caroline's younger sisters, Deliah, was baptised (on 1 March 1904) as the daughter of Lavinia Francombe, 'Travelling Hawker, Single Woman, Blandford', while Caroline's own marriage, to John Hughes (in 1918), was registered under the name Caroline Frankham. She told Seeger and McColl that her father had been a 'rat-and-varmint destroyer', but other sources reveal, unsurprisingly, that his skill set was much broader. In addition to at times being designated merely as 'Labourer' (as in 1882), he clearly followed trades widely associated with Romany males : 'Peddler' (sic - in 1883), 'Hawker of Tin Wares' (1891), 'Tin-Maker' (1898) and 'Basket Maker' (1899). Her paternal grandfather, Eli Hughes (born circa 1825), had followed much the same occupational pattern. While travelling mainly around Dorset, the family had obviously also traversed the well-trodden route into the hop picking areas of Hampshire during the early Autumn, as Caroline's father and a number of other siblings were baptised in Binstead during the month of September, he being christened there as Arthur Hughes, son of Eli and Diana, 'Hawker, Salisbury', on 4 September 1864. I have deviated from the normal format of CD reviews to elaborate on both the singer herself and her family for this reason : however much I might rave about the songs and their performance, or tell you of the goose bumps I get at many points during the singing, and the hours of sheer pleasure I have derived from this release, the reality is that no amount of florid descriptive praise I could heap upon it is likely to convince you to buy it unless you are already predisposed towards its stylistic attributes and contents. Which is a great pity, since it offers so much to anyone with even a passing interest in the old songs and song carriers, and the context in which the cultural items were learned, transmitted and performed. Between the quartet of MT doubles (the Fermanagh one has appeared during the many weeks I was dithering over this review) and another quartet of Topic releases in the second batch of their Voice of the people series, the first half of 2014 has been a red letter period for lovers of 'traditional' music and song from these islands. But for me this one sits at the very top of the heap.